The largest Militant Black Metal festival in Europe is getting even bigger this year: 2 days, 14 bands (representing 8 countries), and a venue large enough to host 1600+ people. 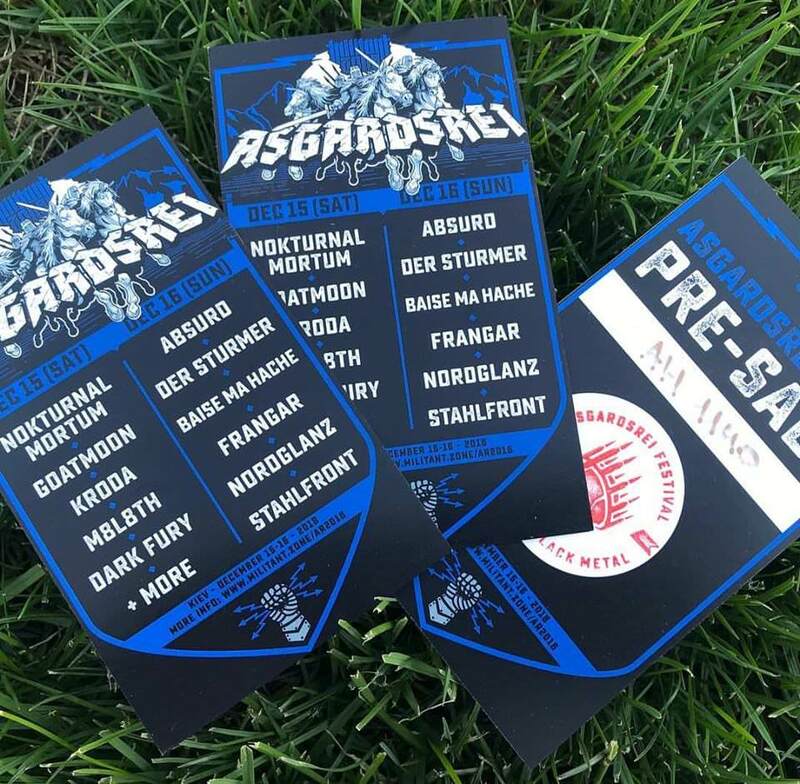 ASGARDSREI 2018 is coming to Kiev on the weekend of December 15-16 with some extra events hosted on the day before the festival. The two-day format of the festival represents legendary bands from EAST and WEST uniting forces to unleash the Wild Hunt! December 15 (Saturday): NOKTURNAL MORTUM (Ua), GOATMOON (Fi), ACHERONTAS (Gr), M8L8TH (Ru), SUNWHEEL (Pl), DARK FURY (Pl), WEHRWOLF (Blr). December 16 (Sunday): ABSURD (De), DER STURMER (Gr), FRANGAR (It), BAISE MA HACHE (Fr), TERRORSPHARA (De), STAHLFRONT (De), NORDGLANZ (De). + PESTE NOIRE will premiere their new album and perform a special acoustic live set (guitars, vocals, accordion and drums) on Friday, December 14 (the night before the festival). + the annual PACT OF STEEL conference will be held on Friday, December 14. The regular price for two-day entrance is 50 EUR (limited to 1400 tickets). The price for VIP places with tables on the second floor is 90 EUR for two days (limited to 100 tickets). Tickets are available to purchase online. Disclaimer: make sure to check your email after placing your order. The venue will be announced one month prior to the event – we’ll decide which club to go for depending on the number of tickets sold. You are welcome to contact us at shop@militant.zone for any questions. Bref, un peu toujours les mêmes à force. Chouette affiche, je vais surement me laissé tenter. Presque pas de surprise au final. Les habitués. Où est PN ? C'est ça le plus bizarre haha. Famine avait dit pas de concert de PN en 2018, donc leurs absences ne m'a pas surpris... BMH c'était obligé du coup. Bizarre, j'avais pas pensé à Frangar. 50 euros les 2 jours. Si ACHERONTAS pouvait en profiter pour axé sur du STUTTHOF, ça serait le nirvana.